Looking for lasting Emoji party favors? 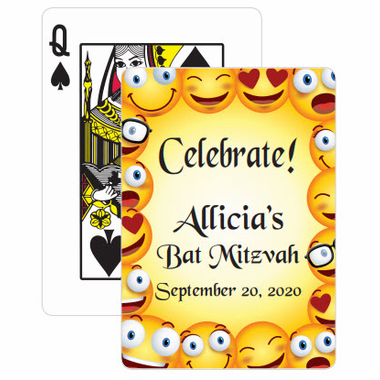 Custom playing cards with a border of different faces will be the hit of your event. 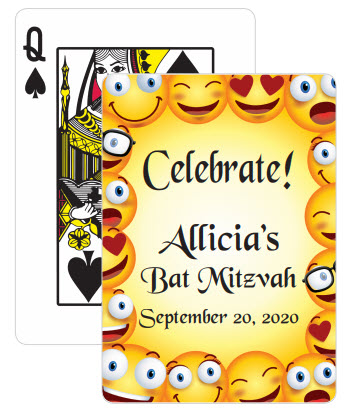 Whether it is a Bar or Bat Mitzvah, Sweet 16, Prom or birthday party, everyone can use these favors. Your playing cards are standard size decks, known as "poker size" measuring 2 1/2" x 3 1/2". PLEASE NOTE THAT THE CARD COLORS ARE NOT EXACT REPRESENTATIONS OF THE ACTUAL CARDS. ACTUAL COLORS MAY HAVE SLIGHT VARIANCES.